Making the Sunburst Sling, Baby Doll Bed, and Tag Along Needlework Tote were supposed to be my "break" from quilting but I found that I feel a little burnt out from all of the interfacing, tedious directions, and (often) difficult tasks that those projects required. So I am tackling a UFO and making a simple baby quilt with a leftover hexagon flower, a Little Apples charm pack, and my scrap bin. It's refreshing to do something very simple and mindless for a change. I am sure it will be finished soon. Thanks for reading! 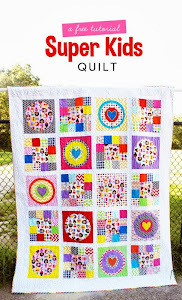 Linking Up with Sew Sweetness. (Pearl bracelet cookies from today's Lizzy House meeting made by someone fabulous and creative within the Seacoast or Boston Modern Guilds). I just got back from attending a lecture by Andover designer Lizzy House. It was something I had really been looking forward to because I very much admire her work. She talked about her journey to designing fabric and was such a wonderful speaker. She really has a gift for captivating the audience and for making you feel happy and excited to be sewing, quilting, and just participating in this "modern movement" when bright, unique fabrics and quilt designs have really come into their own. I really got into sewing around early 2009 when I was expecting my first child and working full time as a social worker. I started discovering sewing blogs and etsy and soon realized there was this world of beautiful fabric that really spoke to me. I loaded up on FreshCut but really fell hard for Pop Garden. I tried to keep up with all the gorgeous collections but soon learned I needed to be a little more selective because there was so much to choose from. I joined a traditional guild and bought traditional books. I tried to garner what I could from these sources and reinterpret things to fit my own aesthetic. It's amazing how much things have changed in just a few years. Modern quilting books are plentiful, the modern fabric market continues to grow, and now modern guilds are popping up everywhere. I am also amazed that within a space of about one month, I have attended lectures by Victoria Findlay Wolfe, Denyse Schmidt, and now Lizzy House- all less than a 45 minute drive from my house. Lizzy House ended her lecture by encouraging us to support each other and never be critical of others work. By only being positive, we lift ourselves up and being negative really only hurts ourselves. I really liked this. Everyone has their own design style and personal preferences, I can appreciate it even if it is different than what I choose to do. We are not in competition with each other- I really do think there is room for everyone. I loved that she urged us to be kind - she is a deep thinker and used her time well in exhorting us to not only follow our passion but also to be considerate of others. Hopefully all of this rambling makes sense - I just had to write down what I was thinking and share my excitement about what I have been thinking today. Thanks for reading and thank you for your kind support of my blog and my work. Last week I had to devote some time to reorganizing my fabric stash - it was becoming ridiculously messy and I couldn't find anything. Hardly any semblance of color order remained. As I was organizing, I came across these two prints sitting on top of each other and I loved the pair together: deep, rich raspberry with jade. I decided to add a bunch of other fabrics and a few colors to the mix (blacks and dark peach) to make a tote (Tag Along designs) for my needlework (usually cross stitch). I used this pattern a while ago to make one for my sister, blogged here. I used that quirky sewing themed print for the lining and other stash fabrics within the interior. To the right is a vinyl zippered pocket, the left pocket is perfect for paper patterns. I didn't notice how crooked the left pocket was until I finished! I quickly decided t's not worth the time to redo it all. I don't have a lot of opportunities to cross-stitch outside my own home but it's nice to have this cute bag to use when the chance comes. Sew Mama Sew is featuring lots of free tutorials that provide great gift ideas for the holiday season. When this baby doll carrier was featured, I couldn't get it out of my mind, but I tried. I knew it wouldn't be easy. There's a reason why I love making quilts: they are flat. Making three-dimensional objects can be a lot more challenging. I decided to give it a try because it's an adorable doll accessory and Charlotte is loving her baby dolls these days. I used some stash fabrics, batting scraps, a bit of interfacing, polyfil, and some "artist's canvas" from Michael's to make this. It came together over the course of a few days. The inside features a pocket for tucking a bottle or diapers or whatever. I have to admit that this came out pretty wonky - I had to stuff it in a closet and try to think of other things after it was finally finished. When you sew the bottom together- you are dealing with 4 layers of batting, the canvas, binding on straps, the interfaced pocket, etc. - binding all that together is not easy. I couldn't have a more lenient critic than my 20 month old daughter, so I am sure she will appreciate it, flaws and all, when she receives it for Christmas. My Christmas Countdown Calendar is done. I am so happy with it and so glad that I saw the QAL by Better off Thread and Melia Mae Quilting. After some encouragement at a recent Boston Modern guild meeting, I decided to add a thick border of my most favorite Christmas fabric that I had featured on my Fabric Friday post here. I am so grateful for my guild friend Sarah who told me she'd spotted this fabric on the bolt at Joann's recently - this enabled me to purchase more for this project, as I had only had a half yard piece. Sarah was also kind enough to give me several pieces of adorable fabrics for this project- thank you Sarah!!!! I backed the quilt in the giant Santa gnomes as well as a leftover piece of Jingle snowflakes. I look forward to participating in the QAL discussion of what types of fun things to include in these pockets. If you have any fun ideas, please comment. 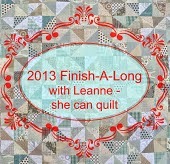 Linking up at Melia Mae Quilting QAL post and Crazy Mom Quilts Finish it up Friday. We had an awesome long weekend and I got a few things done in addition to the Sunburst Sling. A few more capes needed to be made, one for Gregory's only cousin and one for my daughter Charlotte. Once again, I used the Thread Riding Hood tutorial, found here. Finally, I got around to making a thread wreath. You all know I am a yard sale junkie (I go mainly to buy used books and movies, which I resell online) and I often cannot resist thrifted crafty supplies. It got a little out of control a few years ago: I would buy anything sewing related and our apartment couldn't handle so much stuff. So I sold a whole bunch of stuff on Craigslist, including a lot of old thread. I decided to save a bit of the thread and chose to set aside all of the fall colors so that I could eventually make a fall themed wreath, and here it is, finally. Those projects that you always procrastinate often end up being some of the easiest, quickest things, don't they? This took maybe 2 hours on Sunday afternoon - I borrowed my mom's glue gun and got to work. Soon enough, when I have my own sewing space, I would love to decorate it with a thread wreath that features all sorts of different colored thread. Finally, I feel compelled to fess up to a Marden's trip my mom and I took on Monday. I received some tough news a few weeks ago and decided to plan a day trip with my mom, so that I would have something to look forward to. Fabric therapy is probably not the best coping mechanism, says the latent social worked within me, but it was a nice getaway. The store was giving 20% off already reduced fabrics in addition to their super low prices, so most of this was about $2.50 a yard! I am kind of at a turning point with my projects: I still have a small "to do list" of minor UFO's and some Christmas sewing that I would like to accomplish. But overall, I am feeling excited because I have a lot of major WIP's completed and I am feeling excited about starting some new projects soon. The Sunburst Sling is done! I was like a woman possessed yesterday - caring about nothing else but focusing on making this bag. It helped a lot that I had cut my pieces on Thursday and my husband had the day off and took the kids to the Museum of Science yesterday. Still, I am surprised that I actually got this done - I was intimidated by my own plans to give this bag SUPER structure and I was afraid of installing the zipper. Installing the zipper turned out to be one of the easiest parts! I used my most favorite fabrics of all time (I know I might say this a lot about all sorts of different fabrics but this is for real! ): Bloomsbury Gardens by Liberty Lifestyle (the more affordable Liberty quilting cotton). I also used some Robert Kaufman Essex Linen in Black. Both were purchased at Pink Castle Fabrics. One of the most unique fabrics I used was some pieces of a Lilly Pulitzer quilt for the lining. I bought two already cut up pieces at a yard sale this summer for $1. I don't know why that lady cut up the quilt but I've used pre-quilted material in purse linings before and it really saves on time with not having to use interfacing. Using this pretty floral quilted whole cloth quilt adds a special touch to the bag, it's definitely much prettier than the quilted solids that Joann's carries. I bought and installed a "sports" zipper for the bag. I really wanted something durable and luckily they had a decent color and the right length at the store. I put zipper tabs on both ends of the zipper: the pattern only called for one but I think two works well. I am psyched to have a zippered handmade bag finally - no risk of stuff falling out now! I added two big pockets to each side of the lining and sewed a few dividing lines in each of them. I made the strap 30" long instead of 23". I put a long strip of peltex as well as a strip of batting to give the strap more strength and comfort. This bag is as solid as a rock. The front and back panels are layered with fusible fleece, peltex, and a piece of canvas. The gusset is also very sturdy, I skipped the fleece. I found that it worked well to sandwich the peltex between the bag pieces and some coordinating canvas and sew it all around the edge. Relying on the fusible properties of the fleece and peltex proved futile. Sewing the bag and lining together was quite challenging and there was no way I could do the top stitching around the top once everything was turned right side out - but I think it looks fine. One of the most time consuming parts of this project was getting the curved top part sewed together with the patchwork panel and piping detail. I ended up improvising a little and had a fair amount of seam ripping. Instead of sewing the piping to the curved top piece - I sewed it to the patchwork panel and then top stitched it down, then I sewed the top curved piece onto the piping and patchwork. Hopefully this post may help someone making the Sunburst Sling someday. I searched all over the internet for tips but could hardly find anyone making this bag. It deserves to be more popular- it's an adorable and functional design. I think the pattern was well written and easy to follow. I liked that the PDF wasn't 1,000 pages long too- it's important for me to be able to print out my PDF patterns without wasting tons of ink and paper. I am gathering the courage to make a bag for myself. The bag I have been using only has a button closure and my phone fell out of it at the library this week - luckily someone turned the phone in - but I have got to do something different. I also want something that is just for me- not a diaper bag. I received the Sunburst Sling pattern for my birthday a while ago and I am using some black Essex, my favorite Bloomsbury Gardens fabrics, and some pieces of a whole cloth quilt I bought at a yard sale. I also received some great advice from my friend Shannon about bag making. Shannon is a master bag/purse maker in my book, when she was carrying this purse at a church event a few years ago - I had to talk to her and compliment on the absolute gorgeousness of it! She gave me some great ideas on how to add a lot of structure to any bag- I went ahead and purchased some binder clips, jeans needles, canvas, and two types of interfacing. I am going to attempt a zipper too - a lot of this is new territory for me. Wish me luck! I won a different giveaway at Le Challenge blog recently for having made and entered the super hero cape. 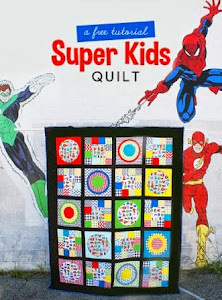 I received another yard of Super Kids fabric and a gift certificate at the Fat Quarter Shop. I used a coupon code in addition to a Pearl Bracelet sale- so I really got a lot of fabric by combining all of those deals. I have never won any giveaways by simply leaving a comment among the hundreds (sometimes thousands!) 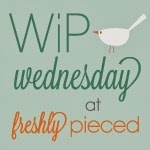 of other commenters on various blogs, hoping to be chosen at random. The secret to winning now and then seems to be entering those blog "events" where you have to actually make something and link what you've made. Finally, I made the difficult decision of what kind of sashing to use for my City Sampler. Pictured below, the first fabric on top is 4.5 yards of a random Benartex fabric that has a linen look but is still 100% cotton. I picked this up and the other fabrics at Fabric Place Basement with a Living Social deal recently. The Benartex amounted to about $3 per yard and it really suits my project. I am not excited about all of that sashing but it's got to be done. While at Fabric Place Basement, I met a beginner quilter who was gathering supplies to make her first quilt. She had a newspaper printout description of the adult education class she was enrolled in. Luckily I stopped her from buying 8 yards of 108" wide fabric for backing. She was going to be making a queen sized quilt, but she could've backed nearly three quilts with so much backing material! I ended up helping her choose a decent ruler and batting ("Sorry but I really recommend you don't get that cheap crinkly polyester stuff that will rip out of your hand if you tug it too much" and "that ruler with the big ridges would drive me nuts!"). Anyway - it was fun to help her out and reminded me of Mary Fons' talk at QuiltCon about the importance of helping the beginner quilter. I still feel like a beginner sometimes - I know nearly nothing about applique, I tend to use inordinate amounts of fabric for paper piecing, and I have yet to truly master the 1/4" seam! True confessions here - I know, it's gritty stuff. Just trying to keep it real.